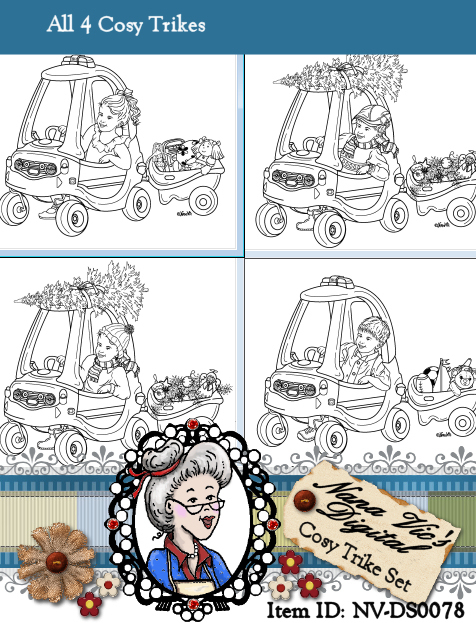 Please take note that ALL 5 digitals that relate to the Cosy Trike are on this page. Christmas Cosy Trike GIRL, Cosy Trike GIRL, Christmas Cosy Trike BOY, Cosy Trike BOY, and ALL 4 in the one set available at a special price........SCROLL DOWN to find the one you'd like. 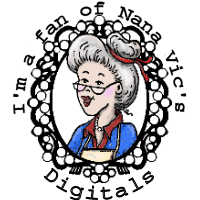 The automatic download contains a 2 digital stamp in both JPG and semi-transparent PNG files. JPG cover image. Word art is a PNG file. All files are in 300dpi for easy resizing or flipping. Description: Move out of the way, this little girl all dressed in her summer clothes is on a mission. Perhaps she's heading for a play date with her trailer full of her favourite little girl toys. 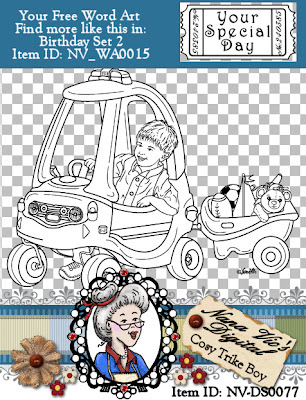 This delightful digital stamp is sure to bring a smile to anyone's face. Bonus word art is from the word art sheet Birthday Set 2 NV_WA0015 and reads; Your Special Day. Description: Move out of the way, this little boy all dressed in his summer clothes is on a mission. Perhaps he's heading for a play date with his trailer full of his favourite little boy toys. 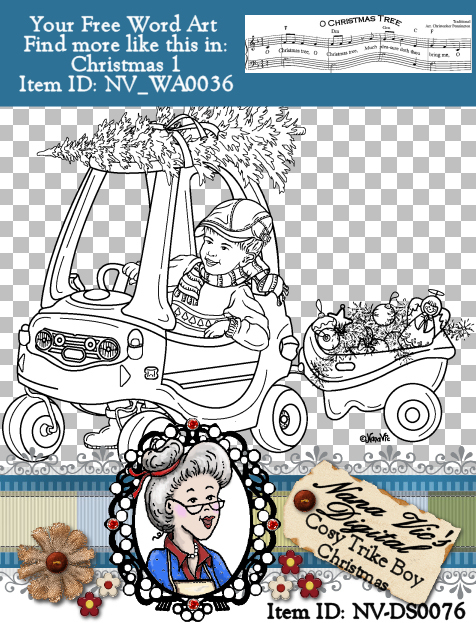 This delightful digital stamp is sure to bring a smile to anyone's face. 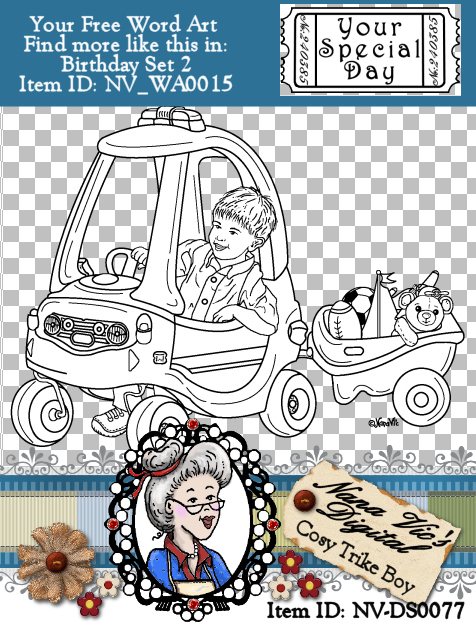 Bonus word art is from the word art sheet Birthday Set 2 NV_WA0015 and reads; Your Special Day. 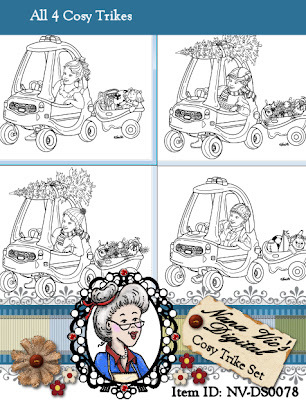 Description: Need to have all 4 Cosy Trikes digital stamps? Then look no further, as you can pick them up here in this special set that contains them all. Purchase them for the great price of only $9.00, that means your only paying for 3 and getting the 4th one FREE. (Also available individually for $3.00 each). There is a boy and girl (individual digital stamps) dressed in winter clothes, with a Christmas tree tied to the roof of their Cosy Trike and a trailer overflowing with Christmas decorations. Also, a boy and girl (individual digital stamps) dressed in summer clothes, with their trailer filled with their favourite toys. The automatic download contains a 8 digital stamp in both JPG and semi-transparent PNG files. JPG cover image. All files are in 300dpi for easy resizing or flipping. Credit to ? Credit to ?